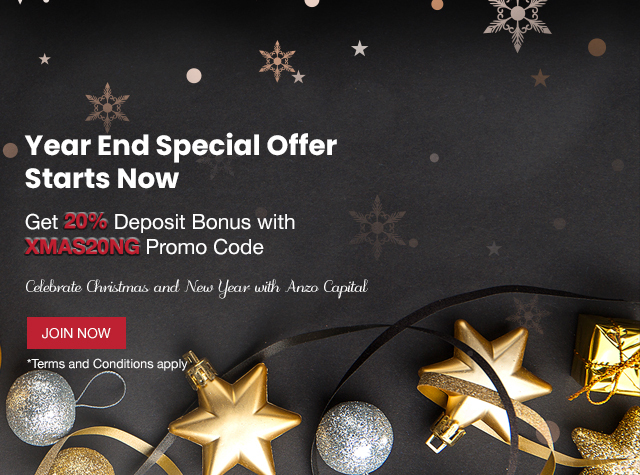 Existing and new clients of “Anzo Capital Limited” (“Anzo Cap”) will be able to enjoy this 20% Deposit Bonus (“Promotion”). This promotion is restricted to the first Metatrader 4 (MT4) account per customer. The crediting of bonus will only begin from a one-time minimum deposit of USD 500. Past deposits before the initial one-time minimum deposit of USD 500 will not be used for deposit accumulation towards your bonus calculation. A 20% trading credit (“Bonus”) will be credited to client’s 1st MT4 account with a cap at USD 2,000. This Promotion is only for Clients who deposit from 5th November 2018 to 30th December 2018 (“Promotion Period”). Clients must enter the promo code XMAS20NG and deposit a minimum of USD 500 to enjoy this promotion. The Bonus may only be used for trading purposes from 5th November 2018 to 30th December 2018 . (“Promotion Period”) and will be deposited under trading credit on Client’s 1st MT4 account. The trading accounts held by the clients for this promotion will not be entitled to receive any other promotions offered by Anzo Cap.